Fifty-eight year-old promotional products supplier, Gemline, has several new product launches a year of its customizable bags, business accessories, gifts, and writing instruments. Keeping up with all these new product launches used to create a huge administrative burden, before CIO Frank Wiggins took steps to manage the company's complex product content needs and third-party integrations. 1. Start by centralizing your data. The lack of a centralized, reliable source of product information was making the Gemline marketing department’s job difficult. Without control or full transparency of the product information that was going online, marketing had minimal freedom to merchandize or promote the product collections in a strategic and timely way. "We knew that everything we wanted to do online relied on us having accurate product information. We needed to make our digital content easily manageable and accessible, so we wanted to have our structured and unstructured content together in one easy-to-use platform”, says Wiggins. 2. Know the requirements for your business. Gemline had existing product data in its ERP and needed a partner that could integrate and provide key elements of product information management and digital asset management. “It became very clear, very quickly that the traditional PIMs were not a good fit for us, they were too expensive and too complicated," Wiggins says. 3. Enable your business stakeholders. The Gemline marketing team needed the freedom to access and change the content they needed without submitting a request through the IT department. The product content syndication features of the Salsify platform give the marketing department control to manage, update and collaborate on all product content for the company website. Gemline is also able to select which product content is shared with external business partners through easily-generated, dedicated product feeds for each partner. This is due to Salsify's single sign-on and user permissioning down to the field level. 4. Anticipate change. In today's rapidly changing marketplace, change is a constant. Lucky for Gemline, the company is used to fast-paced, changing inventory. It needed a technology partner that could react and adapt to its needs in a timely, adaptive fashion. "From an IT perspective, Salsify is easy, fast, and reliable. They are clearly committed to our success”, says Wiggins. 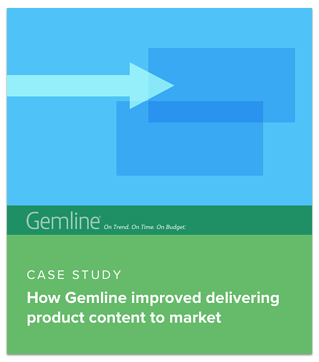 Get the full story of Gemline's transformation of its product content management process. Download the full case study now.